Nat Gould's wife was Elizabeth Madeline Ruska. She was born in Maryborough, Queensland, Australia in 1867. She was known within her family as Lizzie. The Ruska family lived at Stradbroke Island near Brisbane in Queensland. Nat Gould records that Elizabeth’s mother "was a dear old German lady, whose great misfortune was that she could never master English very well; but I understood her, and I think she understood me" (1). She was Christina Ruska nee Beutel. The Beutel family came from Germany. She was probably born in about 1830 in Dalheim, Hesse-Darmstadt. Elizabeth Madeline Ruska's father was Francis (Frank) Ruska, born in about 1836 in Geisenheim, Nassau in Germany, and probably the son of Jacob Ruska and Anna Maria Morsch (2). While Nat Gould was working on the Brisbane Telegraph he met Elizabeth Madeline Ruska on one of his steamer trips out to a place called Humpy Bong on the shores of Moreton Bay near Brisbane. She was the sister of Frederick Ruska, captain of the steamer. She was then nineteen, ten years younger than Nat Gould. “I was standing on the bridge, near the skipper”, wrote Nat, "when I saw her below, and obtained an introduction to her through a friend. I look back upon that day as the best in my life, for the young lady I then met has proved indeed a helpmeet to me throughout my life, and still cheers and encourages me and our family with her bright and happy disposition, her unflagging good spirits, and a capacity for looking after the household I have never found excelled. It was a case of love at first sight with me, at any rate, and I hope I am not disclosing a secret when I say with her also” (3). They were married in Brisbane on 14 April 1886 at the Ann Street Presbyterian manse. Then, having bought a house in Woolloongabba, they settled down to home life, aided by a handsome present of £200 from Nat’s mother. Their first child, a daughter Edith Mary, was born on 28 November 1886, but sadly died on 28 February 1887. Three more children were born in Australia, namely Sydney Nathaniel (born 26 January 1888), Herbert Ruska (born 23 December 1891) and Doris Isabel (born 21 February 1894). In April 1895 the family left Australia to settle in England, eventually at Bedfont near Feltham in Middlesex in a house they called Newhaven (4). There Nat Gould wrote over a hundred more novels and stories. Four more children were born there, Gladys Dorothy (born and died in 1895), Frederick William (born 1898), Winifred Madeline (born 1902), and Norman Henry (born and died in 1905). In accordance with his Will, a trust fund was set up to provide for his wife, but it was only to last during Elizabeth’s lifetime. Then the investment in the fund was to be realised and split equally between the surviving children. The house Newhaven would then have been sold. A copy of the probate document was obtained on May 1927, suggesting that plans for disposing of the house were already then being made. 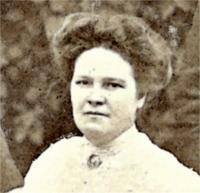 Elizabeth Gould had moved to a new address at 5 The Close in Bedfont. Newhaven was demolished and the existing semi-detached houses were built on the site. Elizabeth Madeline Gould died of pneumonia on 25 August 1927 in her new home. She was only 60 years old but had evidently been ill for some time, as no post mortem was necessary. Her son Sidney Nathaniel Gould was with her when she died. (1) The Magic of Sport page 128. (2) Information on the Ruska Family of Queensland in Australia has been kindly supplied by Andrew Millie. (3) The Magic of Sport pages 127 and 128. (4) The name Newhaven for their home in Bedfont was chosen by Elizabeth Gould. See the interview with her daughter Doris Isabel Marryat in The Mail (Adelaide, Australia) dated 25 November 1950.